Learn the chords for 7 musical instruments! Calling all hobby musicians! If you need help figuring out the right chords for your music, give Chords Maestro a try! You can choose from 7 musical instruments: piano, guitar, bass guitar, ukulele, banjo, mandolin and balalaika. Select your instrument, select your chord and play it! 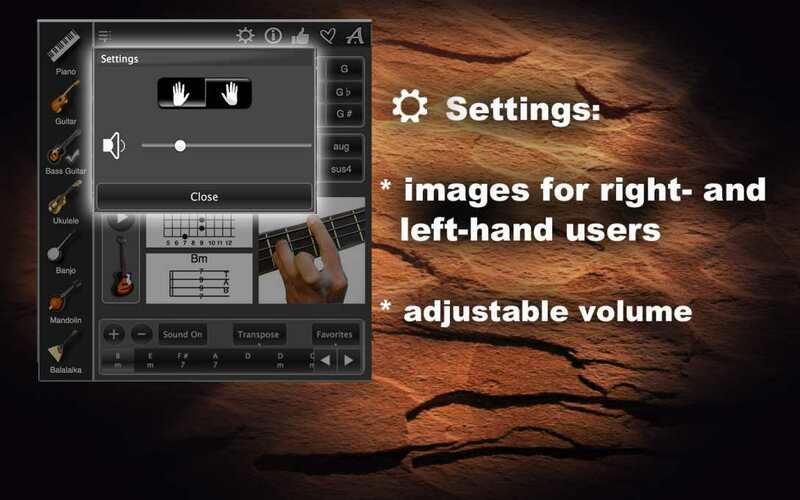 In addition to that, Chords Maestro will display instrument-specific music notes or chord diagrams for your chord and the corresponding finger position on your instrument. If you want to try out different instruments, go for it! It takes just one click, and Chords Maestro will show you what your chord looks and sounds like on a different instrument! Left-handed? No problem! The app’s Settings let you see all the finger positions for the left or right hand, your choice! And while you are exploring the Settings, you can also adjust the volume. Let’s play some chords! Select your instrument, then select your chord (the key and the type of chord). Now play it! You will also see the pictures of what this chord looks like as music notes (for piano) or as chord diagrams (the string instruments). You will also see where your fingers need to go to make this chord. 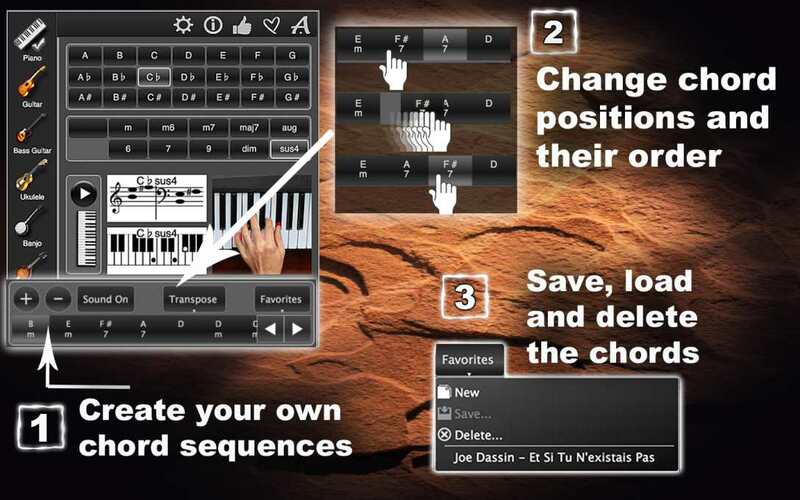 With one click, you can switch to a different instrument and play the same chord or select a different one. Chords Maestro can also help you create chord sequences for your songs, instrumental pieces, or for your practice sessions. Select your instrument, then select the first chord and click on the plus sign. Add your next chord and click on the plus sign again. Keep going until you have your desired sequence. You can change the order of the chords in your sequence any way you want. If you wish to sing along with your instrumental piece, you can transpose the chords up or down to suit your singing range. If you are planning to use this sequence multiple times, you can save it in Favorites. Enjoy Chords Maestro! Download it now! 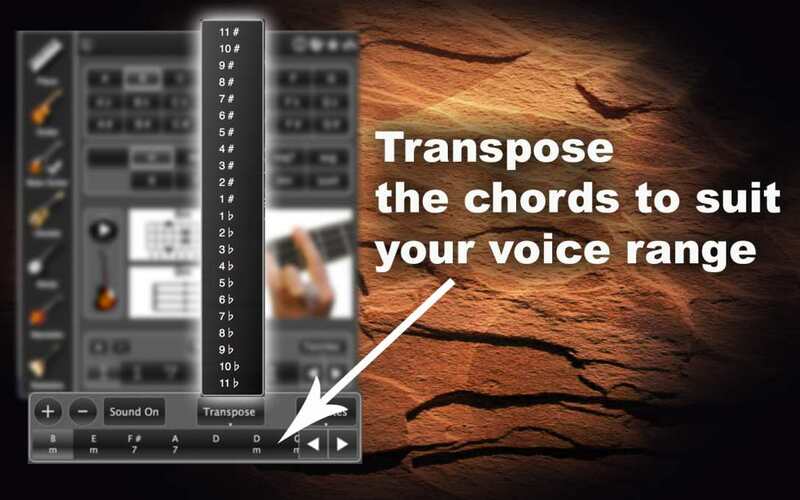 Try our FREE version of Chords Maestro Free! Hello and welcome to Chords Maestro! This app will help you figure out the right chords for any of the 7 available musical instruments, such as piano, guitar, bass guitar, ukulele, banjo, mandolin and balalaika. Chords Maestro will also show you instrument-specific notes or chord diagrams for your selected chord and the finger positions for it on your instrument. If you want to switch instruments, go right ahead! 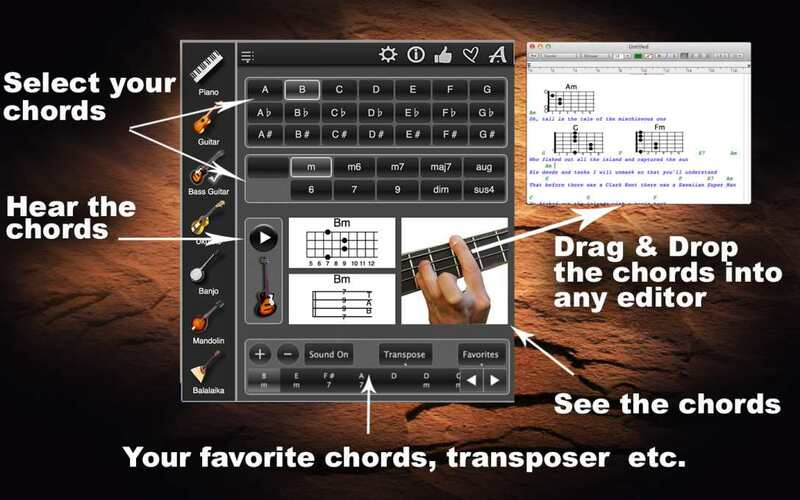 Chords Maestro will show you what your chord looks and sounds like on a different instrument! Let’s start with the Settings. Here, you if are right-handed, select the image of the right hand, and, if you are left-handed, select the left hand. This feature doesn’t apply to piano chords. You can also adjust the volume. Let’s start with piano chords. We select a chord, the key and the type of chord. You will see the pictures of what this chord looks like as music notes and as marked piano keys. You will also see where your fingers need to go to make this chord. Now, let’s play it! Let’s switch to a different instrument, for example, guitar. We’ll play the same chord. See how the music notes changed into a guitar chord diagram? And here are guitar tabs. And a picture of the finger position for this chord on a guitar fret board. Let’s play the same chord on all the instruments! Notice how the music notes, chord diagrams and pictures adjust to the instrument of your choice. 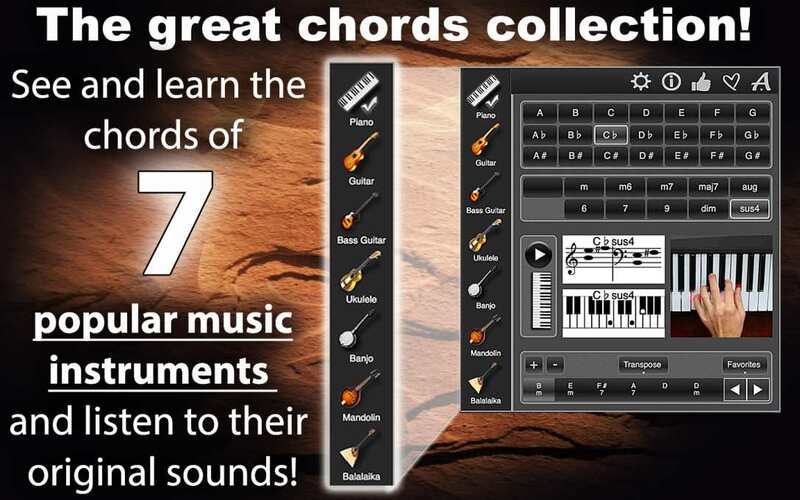 You can also create chord sequences. Select your instrument, then select a chord, click or tap on the plus sign. Add your next chord. Click or tap the plus sign again. Keep going until you have your desired sequence. You can change the order of the chords any way you want. If you planning on singing along with your instrumental piece, you can transpose the chords to suit your singing range. Now, if you want to save this sequence, click or tap Favorites, Save, type in a name for your sequence, done! That’s it! Have fun with Chords Maestro!